The second day of the UK anglers fishing holiday saw the anglers once again making an early start. After boarding the traditional fishing boat the anglers were transported downstream to a previously unfished area. Fresh livebaits were mounted onto large Owner Mutu hooks before being positioned at various intervals across the vast tidal river. After only fifteen minutes a slow but determined take saw line being pulled from the multiplier as a Giant Stingray moved off with the bait deep down below. Engaging the drag on the reel saw the 80lb class stand up rod being wrenched down towards the rivers surface. Fifteen arm aching minutes passed as Rob and Andy battled the unseen freshwater stingray with apparently no impact on the fish. Changing over to a new prototype rod from Conoflex the anglers quickly retied the mainline and resumed their struggle with the unseen monster fish. The Giant Stingray clamped onto the bottom on several occasions during the next forty minutes requiring the anglers to wrench the fish from the muddy riverbed using every bit of their strength. Further pressure exerted from directly above the fish finally saw the monster fish brought off the bottom where it wallowed under the boat in mid water. Moments later the Giant freshwater stingray broke through the surface layers revealing a monster Giant Stingray of almost two metres in diameter! 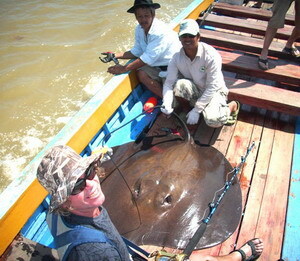 The monster stingray was quickly secured alongside the boat before being transported to shallower water at the riverside. 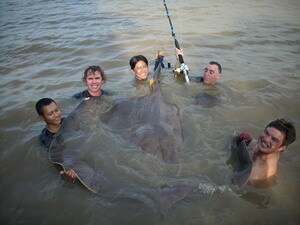 The large female Giant freshwater stingray was found to have a wingspan measurement of 1.75m and was estimated to weigh 185kg’s. The stingray was released shortly after a brief photo session back into the tidal river. With still a few hours left for stingray fishing the anglers rebaited the hooks before repositioning the baits. Some time later that afternoon another run signaled the beginning of yet another battle with a Giant Stingray. With the heavy weight Conoflex big game rod the freshwater stingray soon succumbed to the constant pressure and was brought alongside the boat. The stingray on this occasion was found to be a male and was estimated to weigh around fifty kg’s. The fish was released after a short period of photography before the anglers retired to the comfort of their hotel.